With our electronics recycling, your disposable gadgets will be recycled properly. They may be printers, mobile phones, telephones or TV sets. Our Computer Recycling Services are designed to professionally recycle your end-of-life desktops or laptops. This offer is vital so that the computer units will not be placed in the landfills. The Data Destruction Services that we have are intended to help people destroy the sensitive files and information. Through this process, your privacy will be protected. Our Hard Drive Shredding is the best in town. Why? We’re using the best shredder in the world. Our IT Asset Disposition is proven and tested. We can help you earn top dollars through recycling your disposable IT assets. With us operating in this place, rest assured that you can have the best electronics recycling services in Tennessee. All Green Electronics Recycling is proud to serve the state of Tennessee for all of its electronics recycling needs. For businesses, please call (800) 780-0347 and ask for our Corporate and Government Account Division for more information. All Green Electronics Recycling can be more competitive in accepting your unwanted electronic waste than any other recycler. We serve the entire United States through our extensive network of field service agents. We offer free pickup and scheduled drop-offs of your e-scrap at any of our nationwide locations, 7 days a week. The management of returned or obsolete computer or other electronic products is a growing concern among manufacturers, resellers, and retailers today. All Green works closely with these organizations to effectively control inventory levels, redistribute obsolete products in aftermarkets, and provide end-of-life equipment destruction services. All Green Electronics Recycling will collect and remove your clients’ off-lease IT equipment from their facilities anywhere in the U.S. at no cost to them or to you. We will go to your client’s location, and if necessary, facilitate or assist in the breakdown and removal of their off-lease equipment for resale. If needed, All Green will refurbish the equipment to maximize its resale value. Once an item is sold, All Green pays you 70% of the net revenue. 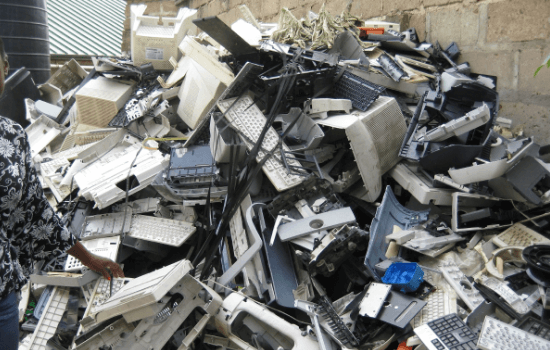 The goal of All Green Electronics Recycling is to take unusable computers, monitors, cell phones, and other outdated electronics and ensure that none of the hazardous material ends up in a landfill. All of the end-of-life electronics we collect are recycled and processed within the United States. All Green is a collector and a recycler. This means that we not only come to your business or home and pick up your old electronics, but we also ensure that all of the material we collect is processed down to the basic commodities right here in North America. Most of the processing for the items we collect is conducted at our facilities in Southern California. Further processing is done at a partner facility in Northern California, and the final refining process is done at a refiner in North America. Most items that we receive are manually dismantled as the first step to recovering all of the commodities. Items that cannot be dismantled in an efficient manner are put through a shredding process. Whole e-scrap or dismantled parts can be shredded down to pieces that are less than 2 inches in diameter. They are then separated through a series of devices all connected via conveyor belts in a process that is 95% automated. The products sold include iron, copper, aluminum, plastic, glass, precious metal mix, and shredded circuit boards. This process ensures 100% data destruction and we provide every client with a data destruction guarantee. We recycle old computers for you or your business so the data never ends up in the wrong hands.